Dandelion Snippets - folklore etc. 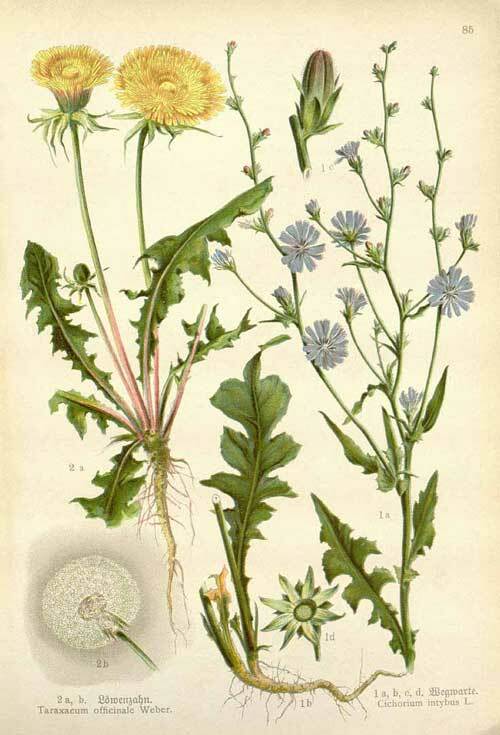 In herbal medicine we use the leaves and roots of Dandelion, a herb which everyone knows. 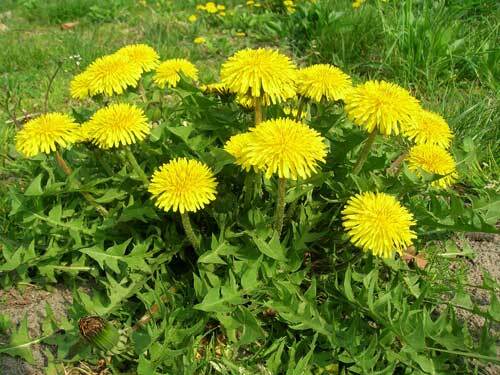 Surely Dandelion is the most maligned of herbs; the bane of lawn-owners all over the world. Many of those same Dandelion diggers will be labouring under a liver congestion that, the weed they are trying to get rid of, could help more than anything! 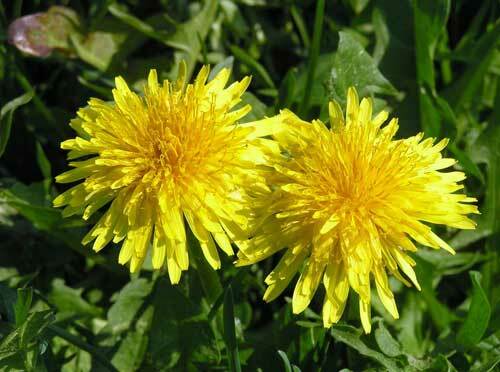 Not surprisingly, Dandelion has been highly regarded everywhere in the world where people have used herbs as medicines. Dandelion root and its greens (the whole plant is medicinal) were used as tonics and liver medicines in European folk medicine from at least the time of the ancient Greeks. In the ancient Indian medical system known as Ayurveda, Dandelion is used to treat various liver disorders such as jaundice, cirrhosis of the liver and enlargement of the liver. Traditional Chinese medicine records Dandelion in use for at least 5 thousand years for a variety of conditions including diabetes, cancers, infections, fevers, snakebites and, of course, liver and digestive disorders. Nicolas Culpeper, over 400 years ago, wrote 'Dandelion has an opening and cleansing quality and therefore very effective for removing obstructions of the liver, gall-bladder and spleen and diseases rising from them. It openeth the passage or urine both in young and old and will cleanse ulcers. It is of wonderful help in cachexia'. (the wasting of severe illness). Thomas Bartram writes 'Dandelion is a powerful diuretic, bitter tonic, pancreatic regulator, galactagogue (increasing breast milk) cholagogue (increasing the flow of bile) antirheumatic, pancreatic and bile duct stimulant, mild laxative, urinary antiseptic, anti-eczema, detoxicant, choleretic (increasing the volume of bile) and says it is indicated for liver disorders, inflammation of the gall-bladder, to counter tendency to form gallstones, to clear a yellowish complexion and brighten the eyes, to stimulate the flow of bile. Rudolph Weiss writes 'Dandelion is one of our oldest medicinal plants. It therefore comes as no surprise that it is recommended in a large number of diseases. Chronic disease of the metabolism and internal organs, especially gout and liver disease are some of the most consistent, long-standing indications for Dandelion and it is a fact that it is one of the best agents with which to intervene in chronic rheumatic disease'. T J Lyle writes 'Dandelion root, in order that you may experience its best effects, must be gathered during the late Summer months after it has accomplished its growth and before the freezing weather of Autumn begins. Boiling impairs its strength. 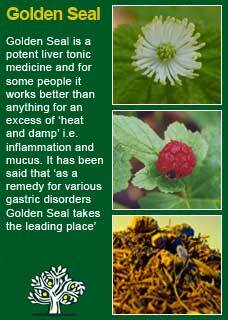 It is a mild, slow, relaxing and stimulating tonic hepatic, influencing slowly the liver, digestive tract and kidneys. It assists digestion and assimilation. It influences the liver in both its secreting and excreting functions. It gives very favourable results in cases of torpid liver, indigestion, constipation and jaundice. It may be used as an infusion or a diluted fluid extract and it is one of the best of the milder agents. Its influence upon the kidneys is also very favourable. Full beneficial action is best obtained when combined with other agents. There have been a number of other studies on Dandelion in one form or another however I personally don't feel that any of them get even close to the heart of what this humble herb can do for us. Like jaundiced lawn-owners all the world over, they are looking at the Dandelion the wrong way! One of the first books I ever read on herbal medicine was by an old English herbalist. He spoke about his experiences working in poor rural Britain in the early 20th century and how he would go to some very squalid homes with children who were failing to thrive and then show the mothers how to dig up and prepare a daily dose of dandelion extract from the plants that were growing right outside their back door. These people had no money for medicine but what they needed was right there, and it was free. The stories of how those children would regain their energy and sparkle by the time he revisited were compelling and obviously written by an honest man with nothing to gain by exaggeration. My first herbal teacher, Dennis Stewart, always used to say, “Dandelion rinses the renal filter and squeezes the hepatic sponge” (renal means the kidneys and hepatic means the liver) Few adult people in the modern world do not benefit from some kidney rinsing and some liver flushing. I find that using some Dandelion in the formula helps everything else to work better and I use a very great deal of it in my work for the young or old, weak or strong who have chronic health problems that are being contributed to by a less than clean blood stream and a less than healthy liver! Dandelion is the first herb I think of for little infants who are having troubles getting their digestion working and so can be suffering from the agonies of colic or the terrible disruption of food allergies when, instead of starting to restrict foods, all the little person sometimes needs is some help getting their liver, and therefore their digestion, into gear, and they will often stop reacting adversely to their foods in a matter of days! Likewise, I almost always think of Dandelion when I meet teenagers and young adults whose skin is exploding with embarrassing acne. In these cases, it may take a treatment that needs a few months and I can honestly say that this has been a life-changing curative to a condition that can be frankly devastating to a person who is at one of the most vulnerable times in their life. 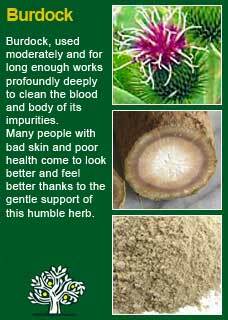 I always combine it with Burdock root for this purpose. 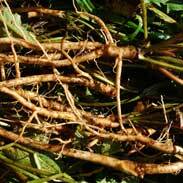 I also very often give Dandelion root to the people I meet who have not been eating well, are drinking too much or who are overworking. The liver takes an enormous amount of the brunt of the stress of such lifestyles and, whilst of course they still have to address where they are doing harm, Dandelion does a tremendous amount to help knit them back together in the meanwhile! Anyone reading this who is studying herbal medicine or who simply wants to understand these great plant allies at a much deeper level would do well to follow the old learning practice of taking a small dose of the tincture or decoction of Dandelion and then, with a quiet and attentive mind, closely observing how their body reacts to the herb. From doing this exercise myself on many occasions as well as with colleagues and students I think there is a rather good chance you yourself will become intrigued with this herb by how you feel what it does within. Perhaps this is the reason I didn't feel any of the scientific papers on Dandelion did it justice; it is a herb that changes things at a deeper level than you can measure or even easily describe. Try for yourself and see! Way back in the 1980s when I was first studying herbs this was the first medicine I made myself; from Dandelions dug out of our lawn and dried in the oven! I will never forget brewing it up and drinking the strong tea. It was like drinking in some kind of elemental energy; exotic, earthy and life-changing. Dandelion combines perfectly with Burdock for deep body cleansing. It works powerfully with Golden Seal, Celandine or Barberry for a congested liver and, for infants or children, a small amount of Licorice softens its bitterness and helps it to be absorbed. The common name, dandelion, comes from the French, dent de lion, which means “lion’s teeth.” The original Latin (Dens leonis) and Greek (Leontodon) names for this plant bear the same meaning and these all refer to the familiar toothed appearance of the leaves. In Greek mythology, Theseus ate dandelions for 30 days to fortify himself to fight the Minotaur, a half man-half bull that ate the young adults of Athens. The modern Latin or scientific name, Taraxacum officinale, has reference to the plant’s use as a healing herb. The genus name comes from the Greek taraxos—a disorder—and akos—a remedy. The species name, officinale, means it is the official species for use in medicine. Dandelion prefers loose, rich, healthy soil, but it can grow just as readily in compacted, rocky, and dry soils. It grows at altitudes ranging from sea level to over 3000 meters in meadows or cracks in the pavement. Dandelion adapts to, and transforms, its environment. It loosens up compacted soil by growing deep roots, brings in worms and activates compost. Dandelion seeds germinate quickly, generally taking from three to six weeks to sprout. Dandelions pull nutrients from the soil so effectively that grass and other plants nearby can have a hard time feeding themselves! Woven into a wedding bouquet, Dandelions are meant to be good luck for a newly married couple. When dandelions appear in dreams, they are thought to represent happy unions. They are also considered to be symbols of hope, summer and childhood. Many cultural beliefs centre on dandelions answering questions or bringing good luck. 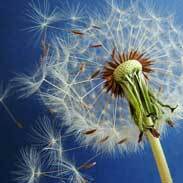 When the seeds are blown of a dandelion it was said to carry thoughts and affections to a loved one. Dandelions have also been used as a variation on the daisy petal plucking past time of “he loves me, he loves me not” If you blow on a white dandelion head and every seed scatters then you are loved. If some seeds still cling to the stalk, then your intended has reservations about the relationship. 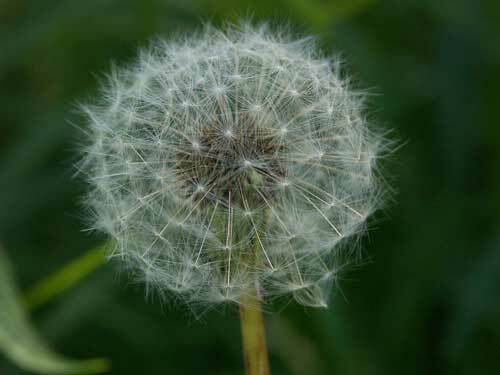 It is also said that if you make a wish immediately before blowing on dandelion, your wish just might come true. Another belief was that the number of seeds left after blowing the seed head indicated the number of children that a girl would have in later life. The sticky white sap was used as a folklore cure for warts and corns. 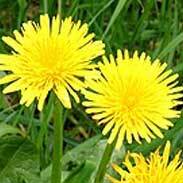 As all parts of the plant may be eaten dandelion is a valuable survival tool. Much of the information here about the traditional uses of Dandelion is consistent with the model of thinking whereby one may treat problem A with plant B. There is value in this approach, especially in how it helps us pass on useful knowledge to one another, but it falls short in one vital area; and that is that people are not all cut from the same cloth! Something that works brilliantly for one person may do less for another -- why is this?